We're happy to provide several local restaurants, small businesses and non-profits in Ashfield and Shelburne Falls with our produce each week. A big thank you to each of them for purchasing locally and supporting our small farm. If you're a local restaurant in Western Franklin County looking to source produce locally, please get in touch! The Blue Rock is the classiest restaurant around and our favorite place to go for a celebration dinner or a date night over cocktails. Their menus change with what's available locally, and they continue to be our biggest supporter. Another big supporter of our farm, the Ashfield Lake House is where we take friends and family and where we head when we're in need of good food, good beer, and good people. It's a place that feels like home. 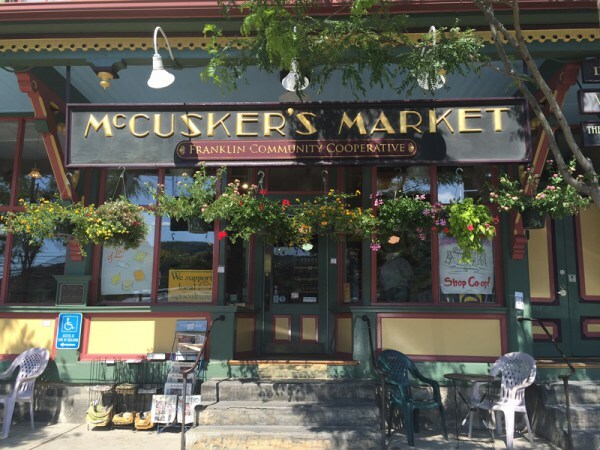 Hands down our favorite lunch spot in Shelburne Falls. Our friends use visiting us as an excuse to travel long distances for the falafels at Hearty Eats. Voted home of New England's best pancakes, Elmer's is a pillar of the Ashfield community, the reason we fell in love with the town and our favorite place to get breakfast. Shelburne Fall's very own co-op. We're proud to stock our hometown grocery store with vegetables from our farm. The place to shop with the cow on top. This little market is a vibrant hub in Cummington, a place for community to gather in the hilltowns. We're so excited theat they contacted us to help round out their offereings of local produce. Gloriosa & Co. is housed at the Curtis House in Ashfield - an insanely beautiful place to throw a celebration. They turn out incredible menus for large scale events using our vegetables. Throw a party with Gloriosa & Co.
Home to an ensemble of preforming artists, Double Edge makes rural Ashfield a cultural destination. While they have expansive gardens, we help supplement their kitchen for the large staff over the summer.